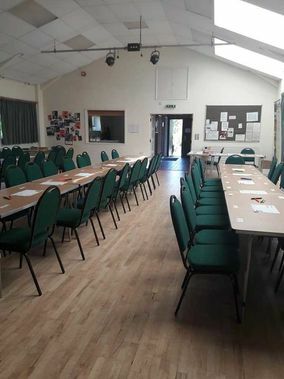 The event took place on Tuesday 15 May at one of our Artsreach venues, Buckland Newton village hall, and the day was broken up into two sessions, one in the afternoon and one in the evening. 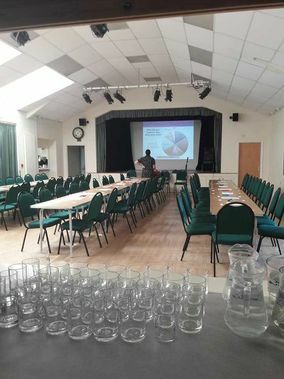 For the afternoon session, our promoters enjoyed delicious cream teas and sandwiches by Helen Furness Catering (based in Cerne Abbas), and in the evening they were treated to a buffet of various tasty treats kindly provided by the Artsreach staff, board and supporters. 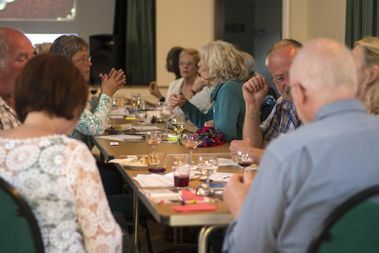 Some new villages were welcomed on board and the day proved to be a successful networking event, with neighboring villages getting to know one another, sharing promotional tips and contacts and working on tasks to get their creativity flowing. Artsreach co-directors Kerry Bartlett and Yvonne Gallimore got to introduce the room to the exciting acts that made it to this year’s menu. 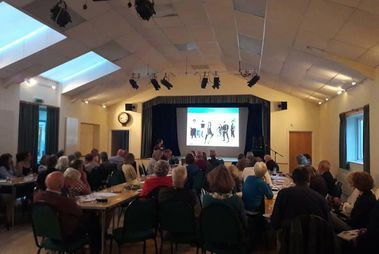 With an eclectic mix of theatre, children’s shows, storytelling, music and dance, our promoters were given a thorough insight into each company, with trailers, clips, and background information to help each village decide what they’d like to host! A huge thank you goes out to all the people who helped on the day, in particular to board member and Buckland Newton promoter Ian Scott and his partner Katherine Hayens who hosted the event. Thanks also to Chairman Fanny Charles, board members Linda Cowley, Rowlie McBeath and Deborah Childs, and Artsreach supporters Pat Yonwin and Barbara Fraser for all their hard work and support behind the scenes. Finally, a huge thank you to our committed promoters, without whom Artsreach simply wouldn't exist! Now it’s up to our promoters to make their choices before Kerry and Yvonne get to work on programming the 2018/2019 season - exciting times ahead!